"Cochin is a city whose indigenous inhabitants have welcomed, befriended and protected Jews for centuries." Cochin is a handy name for a cluster of islands and towns sprinkled with shady lagoons, tropical forests and canals winding past houses on stilts. This is a multicultural land where, in addition to the Jewish sights, one can see Portuguese churches, Dutch architecture, mosques, Hindu temples and a British village green. Like India in general, Cochin is warm and friendly, with an ancient and multifaceted Jewish community that, tradition relates, is as old as the Diaspora. It is a city whose indigenous inhabitants have welcomed, befriended and protected Jews for centuries. Located in the tropical state of Kerala and alternately referred to as Venice of the East and queen of the Arabian Sea, Cochin is one the 3 largest ports on India's west coast and one of the finest natural harbours in the world. The markets are filled with the scent of spices and the shouts of vendors; the docks are lined with merchants' houses and cargo ships and the countryside is sprinkled with shady lagoons and wooded islands. The crystal-blue sky and tropical foliage, the pastel houses, the bright raw silk of the clothes and the ever-present smiles blend into one exquisite rainbow. One legend holds that the Jews first settled in India during the time of King Solomon, when there was trade in teak, ivory, spices and peacocks between the Land of Israel and the Malabar Coast, where Cochin is located. Others put their arrival at the time of the Assyrian exile in 722 B.C.E., the Babylonian exile in 586 or after the destruction of the Second Temple in 70 CE No reliable evidence exists, but most contemporary scholars fix the date at some time during the early Middle Ages. It is the bible that contains the first mention of Jews in connection with India. The Book of Esther, which dates from the second century B.C.E., cites decrees enacted by Ahasuerus relating to the Jews dispersed throughout the provinces of his empire from Hodu to Kush. Hodu is Hebrew for India; Kush is Ethiopia. Talmudic and midrashic literature also mention spices, perfumes, plants, animals, textiles, gems and crockery which either bear names of Indian origin or are indigenous to the country. 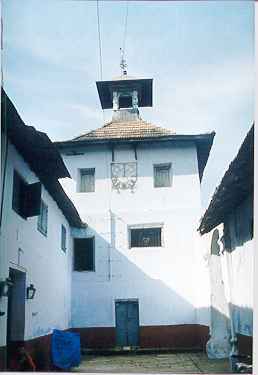 The earliest documentation of permanent Jewish settlements is on two copper plates now stored in Cochin's main synagogue. Engraved in the local language, they detail the privileges granted a certain Joseph Rabban by Bhaskara Ravi Varma, the fourth-century Hindu ruler of Malabar. According to the inscription, the ruler awarded the Jews the village of Anjuvannam, meaning "five castes," as the Jews were believed to be the lords of the five castes of artisans. The plates also state that Anjuvannam shall remain in the possession of the descendants of these Jews "so long as the world and moon exist." 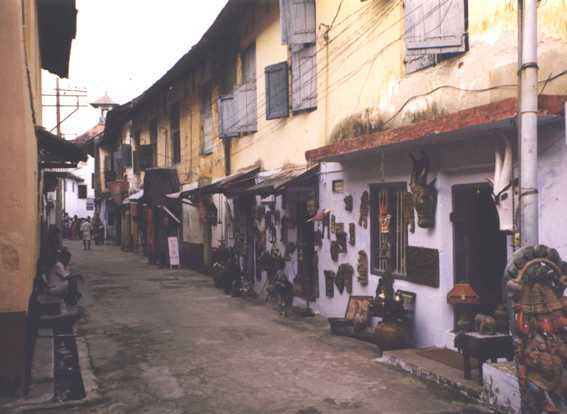 Twelfth-century Jewish, Christian and Muslim travelers described Jewish settlements around Cochin. 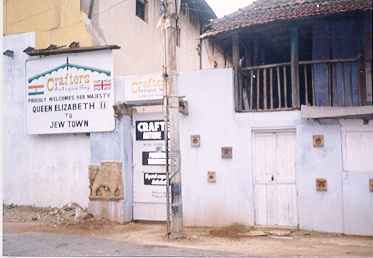 The main community was in Cranganore, north of Cochin. For a time the Jews of the Malabar Coast served as a way station to the Jewish community in China. In 1167 Benjamin of Tudela wrote of 1,000 Jews on the Malabar Coast "who are black like their neighbors and are good men, observers of the law, and possess the Torah of Moses, the Prophets, and some little knowledge of the Talmud and the halakha." The Jews prospered in Anjuvannam for more than a thousand years after the grant of the copper plates. Then, with the extinction of the line of Rabban, dissension arose between two brothers of a noble family for the chieftanship of the principality The neighboring princes intervened and dispossessed the Jews. 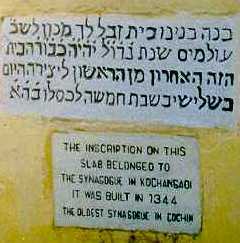 In 1341 the brothers fled to Cochin with their followers and established the Kochangadi synagogue there. In 1524, on the pretext that the Jews were tampering with the pepper trade, the Moors attacked the remaining Jews of Anjuvannam, burning their homes and synagogues. The destruction was so complete that when the Portuguese arrived a few years later they found only destitute Jews, who continued to eke out a miserable existence for 40 more years. Finally, the remaining Jews deserted their ancient settlement and fled to Cochin. As the Portuguese made inroads along the coast more Jews arrived in Cochin, which remained under Indian protection. Spanish and Portuguese exiles came after the Inquisition, and others arrived fleeing persecution in the Middle East. In 1560 the Portuguese set up an office of the Inquisition in Goa, halfway between Bombay and Cochin, and even more Jews sought the protection of Cheraman Parumal, the Raja of Cochin, soon labeled the "King of the Jews" by the Portuguese authorities. 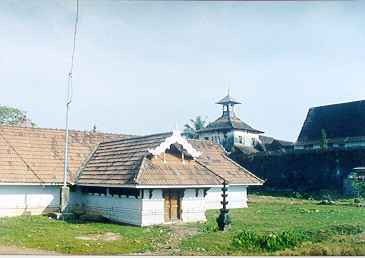 Raja Parumal of Cochin gave land next to his palace for the construction of a synagogue - just 30 yards away from his temple. L-R: View of synagogue from the palace; the King's temple with the synagogue in the background. The Jews could not have survived under Portuguese rule (1502-1663) had it not been for Parumal. In 1565 he gave them a strip of land next to his palace and in 1568 permitted them to build a synagogue not 30 yards from his temple. He appointed a hereditary mudaliar (chief) from among the Jews and invested the position with special privileges and jurisdiction in all internal matters in the Jewish community. This office continued in force under subsequent Rajas and even under Dutch and British rule. The Hallegua family, which still holds the title, continues to be influential in Cochin.